An unofficial Minecraft-fan adventure series inspired by the bestselling game! Fans of the bestselling video game Minecraft, middle grade readers, and action-adventure story enthusiasts of all ages will experience an exciting journey that will take them far beyond the world they know. The Republic of Elementia is in ruins after the Noctem Alliance wages war on Element City. President Stan and his council are scattered across the server, trying to find their way back to one another to continue their fight for freedom. And a mysterious figure has joined their world—one with the power to save or destroy them all. In the stunning conclusion to the Elementia Chronicles trilogy, Stan, Kat, Charlie, and their friends make a last stand for the world they love in an epic battle of good vs. evil. 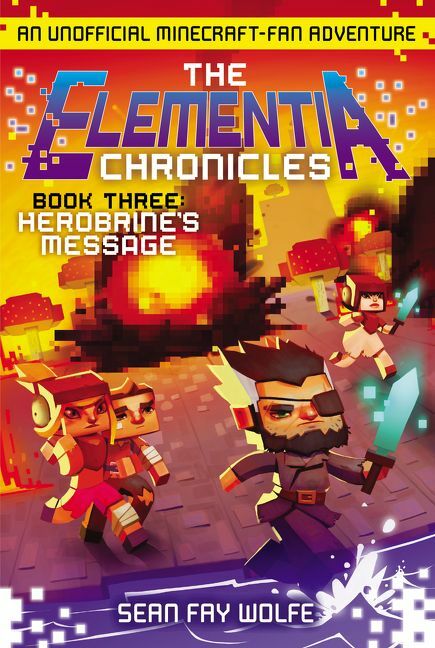 Written when he was seventeen years old, Sean Fay Wolfe's The Elementia Chronicles Book III: Herobrine's Message is the third and final novel in The Elementia Chronicles trilogy. Disclaimer: This book is not authorized, sponsored, endorsed, or licensed by Mojang AB, Microsoft Corp., or any other person or entity owning or controlling any rights to the Minecraft name, trademarks, or copyrights. Minecraft is a registered trademark of Mojang Synergies AB. Sean Fay Wolfe was 16 years old when he finished Quest for Justice, the first book of The Elementia Chronicles trilogy; and 17 when he finished the second book. He is an avid Minecraft player and loves creating action adventure tales in its endlessly creative virtual world. Sean lives with his mother, father, grandmother, two brothers, three cats, and a little white dog named Lucky.